Smithsonian Libraries presented "Mark Catesby’s America: Symposium and Panel Discussion" on June 9, 2008. 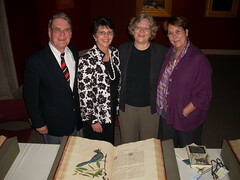 The symposium featured Dr. Storrs Olson (National Museum of Natural History), D. Therese O’Malley (National Gallery of Art), and Leslie Overstreet (Curator of Natural History Rare Books, Smithsonian Institution Libraries). Dr. Alan Feduccia, professor of Biology and Department Chair at the University of North Carolina, Chapel Hill, presented the keynote address, "Mark Catesby and his Natural History of Carolina … : an Introduction and perspective." The event, held at the Freer Gallery of Art, was attended by over 150 guests. Following the symposium, the audience was treated to the Washington premier of The Curious Mr. Catesby. The documentary film, introduced by producers David J. Elliott and Cynthia Neal. The film, an excellent overview to the life and work of Catesby, features Leslie Overstreet and the Cullman Library. A reception followed at the Freer Gallery of Art. View images from the Smithsonian Libraries’ copy of Catesby’s Natural History.